The UK Borders Agency (UKBA) generally doesn’t like to do its own dirty work. It is after all a part of the civil service and accountable at least in theory to government. Its own staff would have to go through proper training programs and be subject to various codes of conduct and so on. Not that all that means a great deal or offers us a great degree of protection. But much of the really dirty work is contracted out to private enterprise companies whose main aim is profit, and are often prepared to cut corners, use poorly trained staff and turn a very blind eye towards their actions so long as the job gets done. One area of activity where this appears to be happening is forcible deportations. Private security guards are used to take people – usually from privately run detention centres – to airports and put them onto flights back to countries to which they do not want to return. Often they have very good reasons not to want to go and a genuine fear of imprisonment, torture and even death awaiting them at the end of the flight. We have an immigration policy which is driven by right-wing racism, in particular in parts of the press which has resulted in Labour and Tory parties engaging in a bidding war to show themselves to be tougher on immigration than each other. The rules have been revised time after time to make it harder for asylum seekers to pursue their claims, with fast-track procedures being used to prevent proper consideration of cases. Those working in the UKBA are under great pressure to play the numbers game, removing as many people as possible. 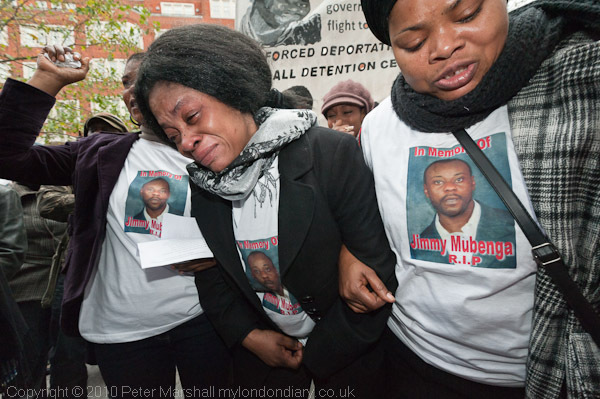 Deporting people like Jimmy Mubenga makes no sense. He’d been living in this country for 16 years, doing a useful job and contributing to our economy, paying our taxes and bringing up a family, who only know England, having grown up and been educated here. Stupidly he got into a fight in a club – the first time in years here that he had been in trouble – and was sent to prison. Because of that, after serving his sentence, a short time later he found himself being forced onto a plane bound for Angola, the country from where he fled for his life. Had he arrived back there he was convinced he would be killed or imprisoned, and very probably he was right, but we will now never know. It took three men to get him on that BA Flight at Heathrow, and the witnesses say that they held him down as he screamed “They will kill me” again and again, and they held him down more and he screamed that he couldn’t breathe and they held him down more and everything went quiet and still they held him. Finally they called an ambulance, but the paramedics were unable to revive him. Few forcible deportations make the news, but this one did. Unusual because a man was killed in front of witnesses rather than simply disappearing in another country. This was news, at least for a few hours – and should become news again when – assuming the Crown Prosecution Service can’t find a way to brush it under their extensive carpet – the three men responsible come to court. 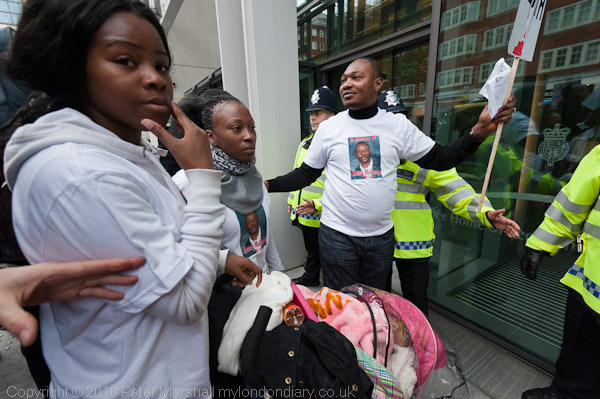 A month after the killing, Jimmy Mubenga’s family and various campaigners for justice for immigrants marched from the Angolan embassy to the Home Office to hand in a letter asking for a full inquiry not into this particular case – which is still the subject of a police inquiry – but the procedures used in such deportations, as well as asking that the Mubenga family’s immigration status be urgently resolved and that they be given indefinite leave to remain. I was surprised to find that there was almost no interest in the event shown by the press. Apart from myself there was one other photographer and one videographer present; the only other journalist I saw was from a small left-wing daily. My story with some pictures went up on Demotix within 24 hours. A quick Google search finds no other report of the event (though the Guardian has covered aspects of the case well), other than a short note on BBC news obviously written by someone who wasn’t there that simply noted the march was taking place, and misleadingly refers to Mubenga as an “Angolan man who fell ill as he was being deported.” Asphyxiation as a result of having three men on top of you is not an illness. A Home Office official takes the letter. The family were upset that no-one could be let in to deliver it. 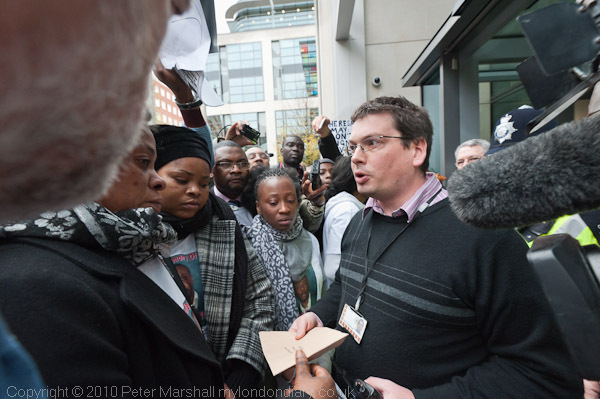 You can read more about the event and see more of my pictures in RIP Jimmy Mubenga – Killed at Heathrow on My London Diary. It’s the kind of story that makes me feel that what I’m doing is really worth doing even when I know I’m unlikely to sell any of my work from it. I didn’t find it easy to take some of these pictures, and there were times I didn’t take pictures, but I think it was something that needed to be recorded. This entry was posted on Monday, November 15th, 2010 at 03:46 pm and is filed under My Own Work, Political Issues. You can follow any responses to this entry through the RSS 2.0 feed. You can leave a response, or trackback from your own site.